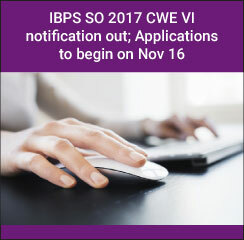 IBPS SO CWE VI- The online registration IBPS SO 2017 CWE VI will begin from November 16, 2016 according to the official notification released by the Institute of Banking Personnel Selection (IBPS). IBPS SO 2017 recruitment exam will be conducted for a total of 4122 Specialist Officers (SO) in 20 participating public sector banks. The IBPS SO 2017 application form can be filled on or before December 2, 2016. Candidates can fill the IBPS SO 2017 application form in the online mode. The registration process of IBPS SO 2017 can be completed in five steps where the first stage involves obtaining the online registration number while the second and third stages include uploading photograph and making payment. IBPS SO 2017 will be conducted in two stages – written test and interview. The written test is scheduled to be conducted in a computer based mode on January 28 and 29, 2017. The interview of IBPS SO 2017 is scheduled to be conducted in March, 2017. Candidates with a minimum age of 20 years and maximum of 30 years as on 1 November, 2016 are eligible to apply for IBPS CWE SO VI. Along with this candidates must have graduated in requisite discipline from a university recognised by the Government of India or any equivalent qualification recognised as such by the government. IBPS so cutoff in prelims for marketing officer? I have cleared ibps mains so i am unable to see my scores so when can i see my scorecard and how. IBPS SO Mains Result 2018 Announced! I have done MBA in fin. and market.there is no major & minor but I have made MRP in fin.can I give IBPS SO exam in Marketing. Your IBPS SO brochure has been successfully mailed to your registered email id .